We shouldn’t fear muscle fever, writes personal trainer and physiotherapist Sarah Cremen. 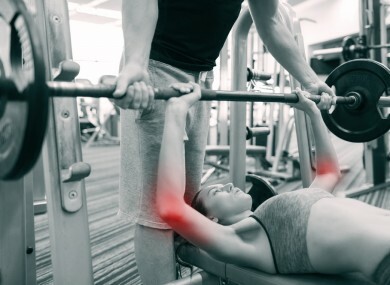 IF YOU’RE NEW to the gym or have been absent for a stretch of time, you’re probably all too familiar with ‘muscle fever’ or more commonly, delayed onset muscle soreness (DOMS). In all your new-found enthusiasm for training, you work out with intensity. You squat, you lunge, you push, you pull, you feel great doing it, you feel great after, you wake up the next morning and still feel pretty great but then. Boom. You feel like you’ve been hit by a truck. It’s like your body forgot how to function; you feel stiff, sore and it hurts to laugh, get down stairs, and straighten your bloody arms. You have DOMS. Let me start by saying, it’s totally natural and you will be okay. As a result of strenuous exercise (any exercise really, but primarily strength training), micro tears occur in your muscles and even though it doesn’t sound particularly pleasant, the process of breaking them down and consequently repairing and rebuilding them, is an essential part of building new muscle. DOMS is a phenomenon that current medical science struggles to explain, but the most likely explanation is that it’s a mild form of metabolic poisoning called rhabdomyolysis (or “rhabdo”, and I say mild as an occurrence of true rhabdo would be a medical emergency). Rhabdo in this sense is a result of a cocktail of waste metabolites and by-products of tissue damage, but think of it as nature’s tax on exercise, and everyone must pay. It usually peaks at about 48 hours post workout, but can last up to 72 hours total. The good news is that as your body adapts and gets familiar with certain stresses (in this case, training), the DOMS you experience should be less frequent. However, change your routine or skip a few weeks and it will most likely return. So, is muscle soreness good for you? Is it indicative of a good workout? I mean, if you’re supposed to be breaking down your muscles, then it must be, right? No pain, no gain and all that. Well, yes and no. The soreness you feel post workout can certainly mean that you adequately pushed your body to elicit a response, but it is not something that should happen after every session. In fact, if it is, it’s probably a sign that you need to reassess your recovery protocols. ‘Stimulate, not annihilate’ isn’t the easiest balance to strike when you’re new to training and unsure of your body and its responses to different stimuli. Try trial and error, self-experimentation and some of the recovery methods below. Okay, I have DOMS but what do I do now? Well, nothing really decisively helps with recovery from DOMS. The general consensus seems to be to just get over it and no better way than to move more. Sound counter-intuitive? Bear with me. When you exercise, you increase blood flow to your muscles which helps expedite the recovery process. I’m talking about easy, light work such as mobility, stretching, yoga, anaerobic cardio or light weights. Epsom or magnesium salt baths, drinking more water, taking in foods with plenty of protein and antioxidants (green, leafy veg, colourful fruit and berries…) and taking curcumin (an anti-inflammatory found in turmeric, take this with black pepper extract or else it will be poorly absorbed) can also help, but movement really trumps all. It probably won’t feel great to start with, but persevere and a few reps in, things will start to ease out and the pain will subside. So please don’t just sit at your desk feeling sorry for the state you’re in; get up and get moving! DOMS is a natural process. The soreness will pass but you can help it by continuing to move. Don’t let the temporary pain put you off. Stick with your workout regime and lighten it up where necessary. Email “No pain, no gain! Why it's normal to feel sore after the gym and how you can ease stiffness ”. Feedback on “No pain, no gain! Why it's normal to feel sore after the gym and how you can ease stiffness ”.